★UPGRADED DESIGN: Boasting a new and improved silicone insert, our Elbow Brace will support and secure stiff and sore muscles, improve shock absorption, impact resistance and compressive strength. Made to take your elbow shape without deforming or oxidizing. ★PREMIUM QUALITY: You'll love our ultra-soft, non-slip inner Suede fabric that ensures our Elbow Support Braces are comfy, breathable and sweat absorbent. The outer LYCRA fabric is built for extended durability and resistance to wear & tear. ★OFFERS EFFECTIVE PAIN RELIEF: Boasting a supreme silicone compression pad that is primed for ultimate force absorption, this Strap Band helps to relieve pain, prevent injury or tendonitis due to strenuous and repeated arm, elbow and wrist movements. 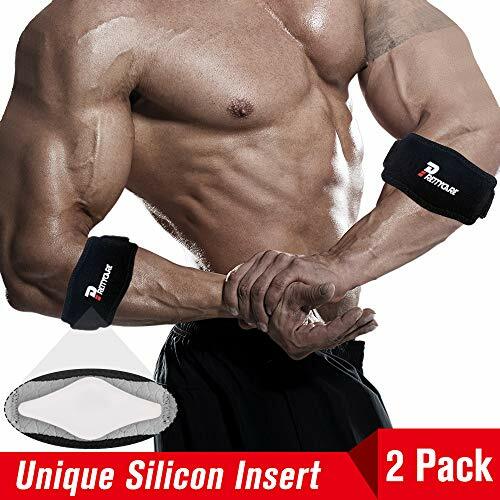 ★VERSATILE: Use our handy Tennis Elbow Brace as an armband to limit elbow hyperextension when weightlifting, basketball etc. Offers superb tissue and joint pain relief when playing tennis, pool/billiards, golfing, rowing, fishing or using you Pc mouse. ★ONE SIZE FITS MOST: A convenient double adjustable loop ensures this tennis elbow bracelet fits forearms from 9-23 inches (22-59cm). The perfect alternative to copper elbow compression sleeves. Can be worn by both men and women. Why Wait? Order Yours! If you have any questions about this product by PrettyCare, contact us by completing and submitting the form below. If you are looking for a specif part number, please include it with your message.